It doesn’t take a major accident to sustain a painful injury. Whiplash can occur with an auto accident at speeds as low as 5 miles per hour. A slip and fall on an icy sidewalk can leave you with ongoing back pain. Lifting, bending and twisting while shoveling snow may cause an injury also. Whatever the cause of your personal injury, a Doctor of Chiropractic at Caron Chiropractic Clinic, P.A. can do an evaluation to recommend corrective treatment. We have a Natural Approach to help with personal injury relief without the use of medications or surgery. If you have been involved in any sort of accident or are feeling the effects of a repetitive use injury, now is the time to consult with a Licensed Dr. of Chiropractic Care. Symptoms may not show up for days or weeks after the accident. However, insurance companies may require that you seek a diagnostic exam very soon after a traumatic injury has occurred. Starting corrective treatment soon after an accident can help to alleviate painful symptoms and prevent it from becoming a chronic problem. 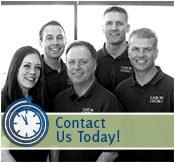 The staff at Caron Chiropractic Clinic, P.A. is well versed in dealing with insurance claims and can guide you through the process. We accept most health insurance from common providers. An accident can happen anywhere. The following is a list of common reasons for the need of Personal Injury Relief. Caron Chiropractic Clinic, P.A. has a combined more than 30 years of experience with providing Personal Injury Relief. The Licensed Doctors of Chiropractic Care at our St. Paul, MN clinic utilize a natural approach to healing from traumatic injuries. We offer many paths to recovery such as chiropractic adjustments, rehabilitation exercises, massage therapy and more. Each corrective treatment is noninvasive and drug-free. This entry was posted	on Saturday, December 20th, 2014 at 7:00 pm	and is filed under Chiropractic Treatments, Chronic Pain, Personal Injury. You can follow any responses to this entry through the RSS 2.0 feed. You can leave a response, or trackback from your own site.